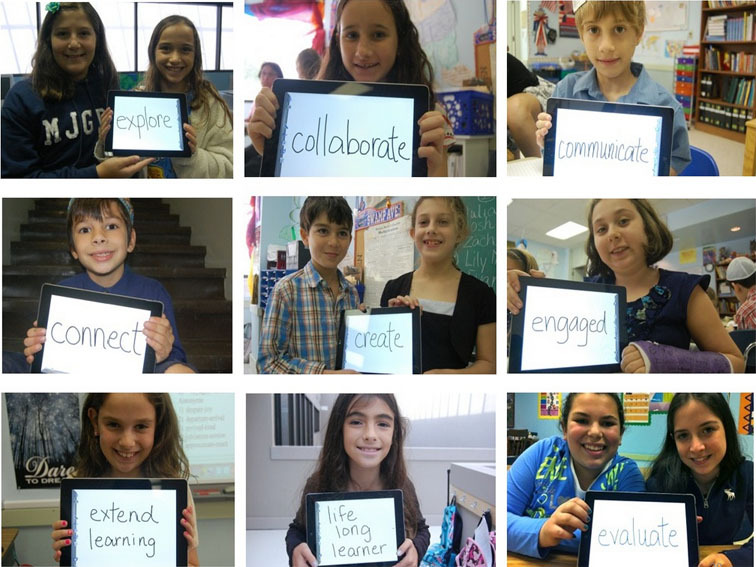 For many schools this year, the dream of having iPads in the classroom turned into a reality. Some schools have brought them in through 1:1 initiatives and other seen them start to flood in after implementing BYOD policies. As with anything else, teachers have seen some pros and cons with this cool, new classroom technology. Here’s a list of some things to expect with iPads in the classroom. This one’s pretty obvious, but they really do. 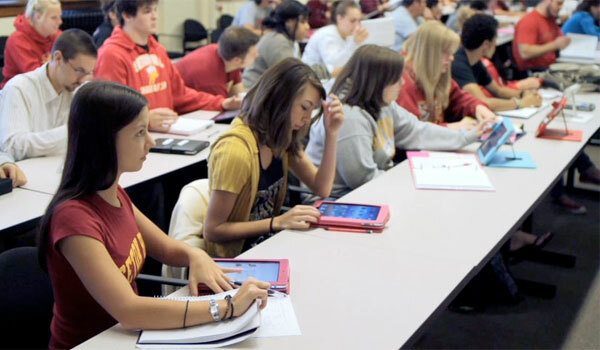 iPads in the classroom will get even the most stubborn students excited and engaged. This is one of my favorite things about it! My phone won’t even last me through the day but my iPad never lets me down. This mobile device will make it through the whole school day without dying, which is essential for school use. The iPad has the ability to interact with a variety of apps. There seems to be an app for everything these days, and the number of educational apps just keeps growing. iPads can pretty much eliminate the need for textbooks. Yay, no more back-breaking book bags! Plus, e-books save tons of trees and they are more up-to-date. Have any shy students not willing to speak out in class? Using iPads in the classroom can help fix that. You can use them as a polling tool or let students ask questions or make comments during lectures and address them either as they come or after the lecture. With the iPad students can communicate the teachers and other students instantly. The iPad is the perfect mobile device for viewing content. It really is a great way to experience the web, watch podcasts and videos, read books, and do research. There are many apps for students with cognitive disabilities. It has really been useful for students with who have problems with communication skills like autistism. The iPad is much more lightweight than a book bag full of textbooks, notebooks, and binders. Students can cram all that into the iPad and easy take it with them anywhere. The touch interface and app system on the iPad makes it easy to access learning tools. It’s “ON” instantly, and the apps open just as fast. It’s simple and easy, perfect for even younger students. The iPad has largely been positioned by Apple as a companion device to computers even though many people use them to do everything they normally do on a computer. Multiple windows and files can’t be kept open side by side. Although this is definitely a negative if you are trying to multi-task, it may be good for keeping your students focused on the one thing they are supposed to be doing. Many schools find the iPad is just too expensive. One solution to ease some of the financial burden would be to allow BYOD or even for schools to purchase the cheaper iPad mini instead. Of course there is the possibility of student being distracted and wondering onto other sites. As I started earlier the iPad is a great content viewer, but unfortunately it’s not as great for content creation. It’s better for light writing. Steve Jobs once said, “typing on the iPad is a dream.” Well, in truth, it is not a dream. It is not like a computer keyboard, which makes it difficult to type longer emails or documents. I much prefer a real keyboard any day. Syncing your iPad to an Apple wireless keyboard is a great idea if you’re going to be doing a lot of typing. iPads were designed to be personal devices. With the incapability to enter logins, each student needs his/her own. Personal information can't be stored if students are sharing iPads. Saying all of this I think these mobile devices make great learning tools. I think that the positives of the device make it worth the negatives. 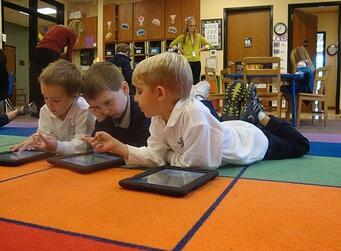 Having iPads in the classroom can be very exciting for teachers and students. Just make sure you are planning and implementing them correctly. SecurEdge can help you with this process to make sure you get the full benefits of using iPads in the classroom. If you have any questions, please contact us here for a detailed consultation.